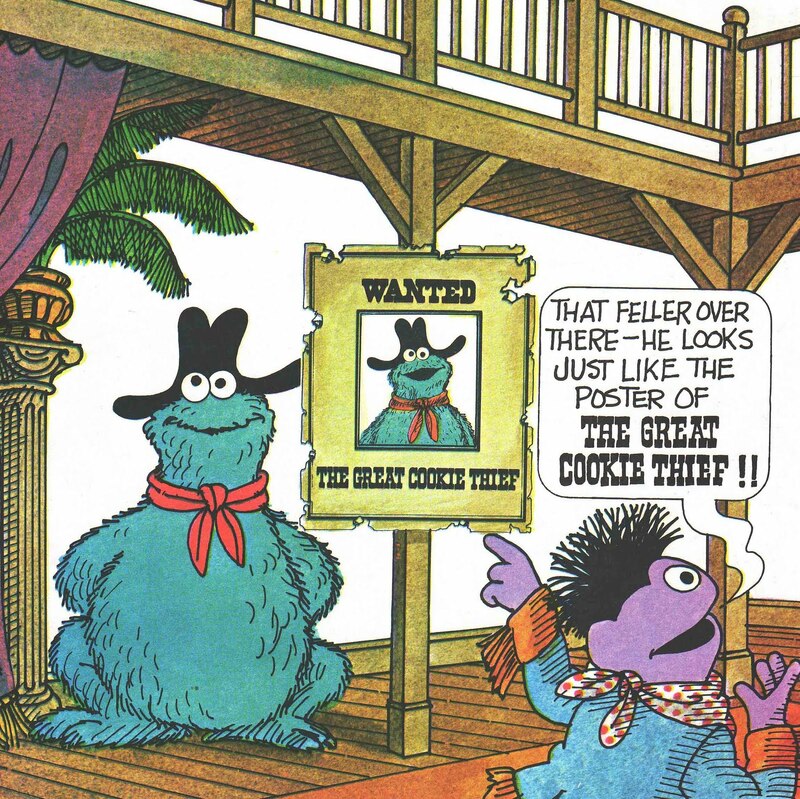 The skit takes place in a western bar where a WANTED sign hangs for the infamous, Great Cookie Thief... but when the real Cookie Thief (Cookie Monster, surprise!) shows up, the locals use their skills of deductive reasoning to ascertain his identity. 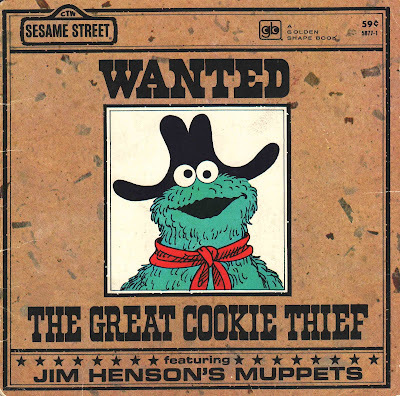 An all-time great Sesame Street ditty, one that my son asks to watch over and over again from his Old School collection. Already Narnia and Hogwarts are monopolizing my son's free time. As the magical Sesame Street-aged window closes on us--and though I've been able to keep my son from the red fiend known as Elmo--I'll lament the day when my old Bird Bird and Grover videos head to the attic for good. Sad that my son only met Mr. Green Jeans once, in a fleeting YouTube video. But hey, I can't expect the boy to relive my entire childhood, can I? I love this book! Cookie Monster rocks! 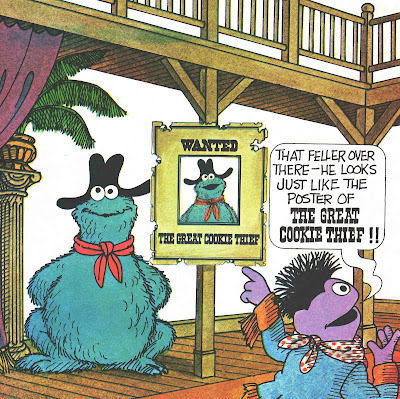 There is an animated (sort of) version of The Cookie Theif too... it looks just like this book (because it was adapted from it)! It was a Golden Book Video. 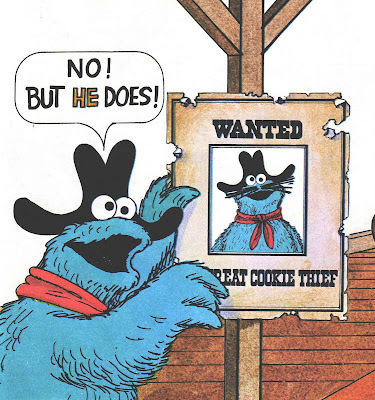 Go see it on YouTube "Three Sesame Street Stories (Part 3 - The Great Cookie Thief)"
I loved this segment on SS. Didn't know it was also a book but now I wish I owned it. You should find a copy of "Big Bird's Busy Book" before it's too late. 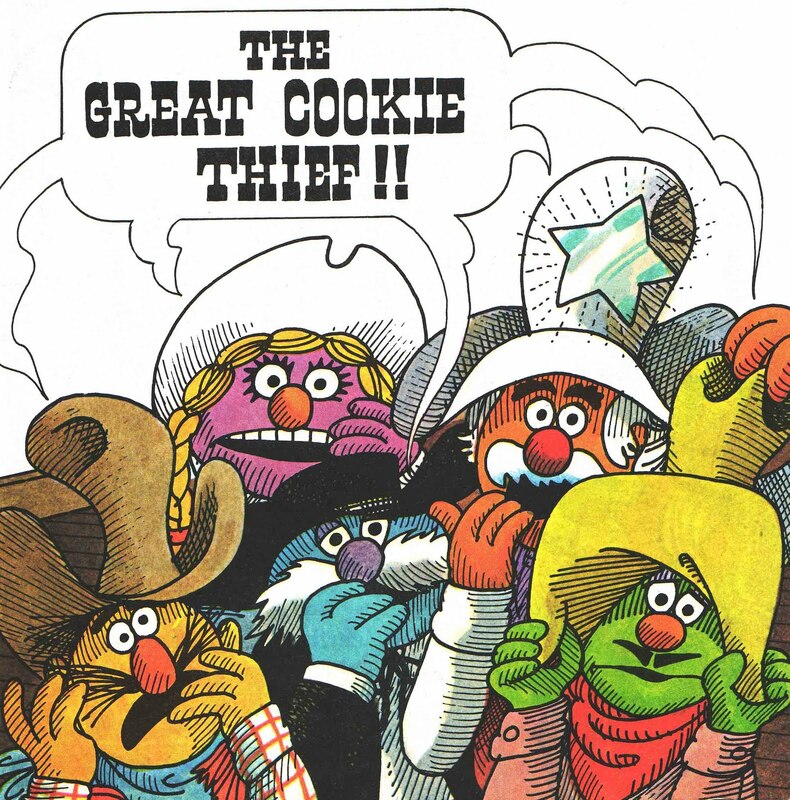 Great pre-Elmo Sesame Street stuff. WOW. I watched the golden book video of this over and over when I was kid. To see it resurface today... it just makes me feel so old. How ironic... 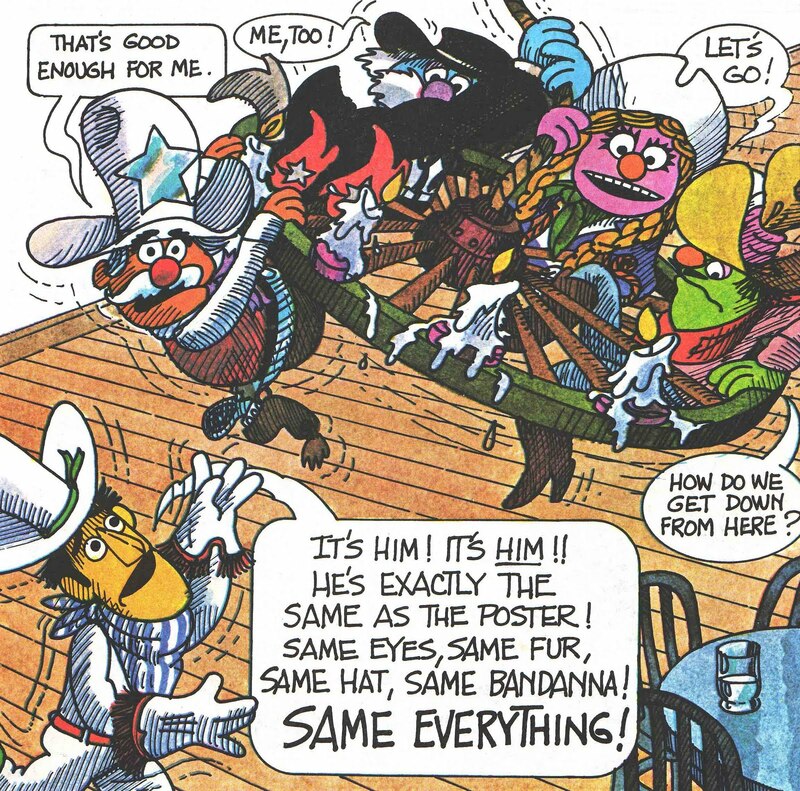 I literally just found the Sesame Street Great Pet Show book (the one the came with the record) in my parents' basement yesterday. My 3 year old loved it! I'm glad my mom didn't toss it all these years! Oh, I love the old Sesame Street books. I have a few and they are some of my favorites!!! 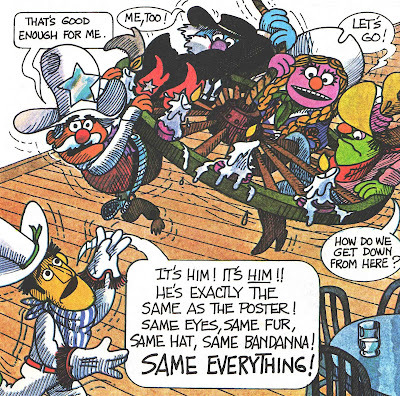 Sad, how I think Elmo added and also took away from Sesame Street. I miss the old characters. 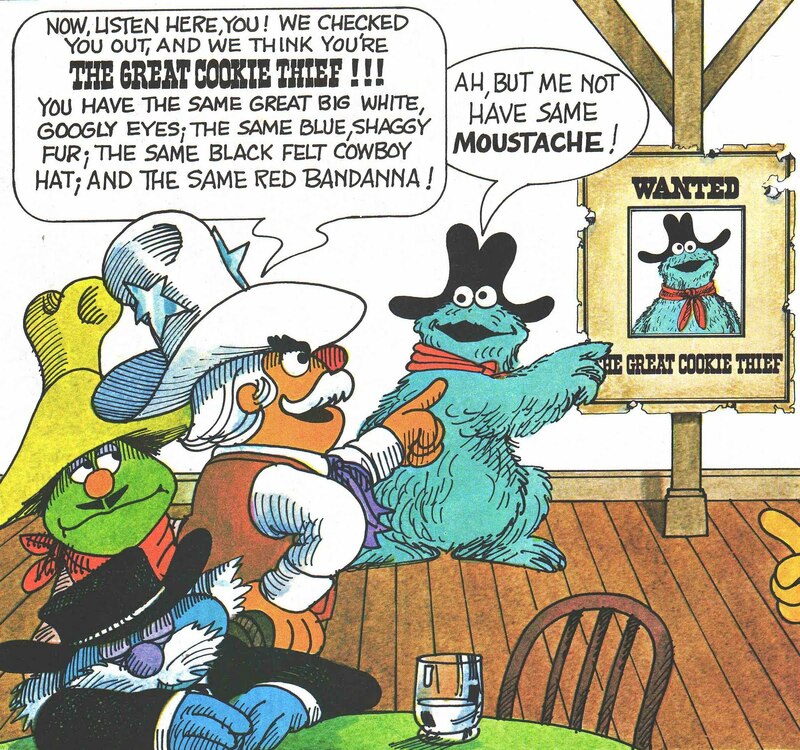 There should be a reunion Sesame Street where old meets new... That would be fun!! I found a copy of 'Grover's Super Surprise Book' at our thrift store a couple months ago for a dollar. It's a 32 year old book, but almost all the pop-ups and paper levers (like when you pull Grover up an elevator) still work. I was amazed! Plus, my 3-yr.-old LOVES it. 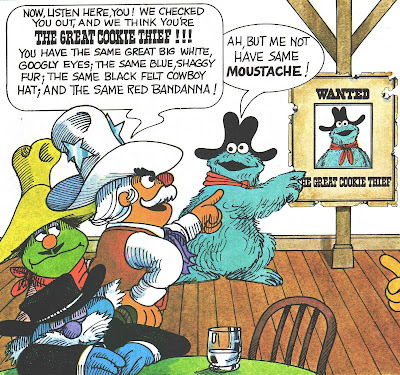 Gotta love that old school Sesame Street!